I've met the Queen, well seen her at close quarters a couple of times in my life (I agree that's not quite the same) but each time I was obviously intrigued and nosey enough to make a small effort to stand and stare. I'm not much of a royalist but I accept them for what they are and soley on the basis that every American I have ever met (if a corgi breaks wind it makes the American news networks) would give their left leg for a royal family I would rather have them than not. Their extended family can take a hike but I am secretly proud of our Queen and grateful for our monarchy and all of it's pagentry and history. 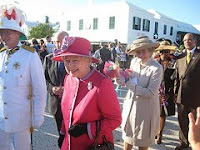 This week was Queen Elizabeth II's first visit to this island since 1994 and it was exactly 56 years to the day after her first ever trip here when she made Bermuda her first stop on her 1953 coronation tour. Her Majesty and The Duke of Edinburgh arrived on Tuesday and left for Trinidad & Tobabo on Thursday afternoon, where she was opening the Commonwealth Head's of Government meeting. There was strange indifference in the media up until a day or so before she arrived but an itinerary finally came out and we decided not to wait and headed to St George's to see if we could spot her just after the royal party arrived on a British Airways chartered flight (no more royal jet of course) on Tuesday afternoon. We met some friends on the way and joined those assembled in King's Square. The Royal Gazette headline reckoned on a crowd of thousands but if you took away the people that were made to be there such as school kids, brownies, cubs, girl guides, the island's regiment and local dignitaries, then by my reckoning it was definitely more hundreds than thousands but there was plenty of flag waving and smiles. 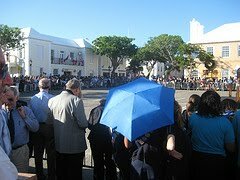 After the 21-gun salute went off without any warning and tested my daughter's hearing The Queen and Prince Phillip walked into King's Square and stood on a makeshift platform as the Bermudian Regiment played the national anthem. 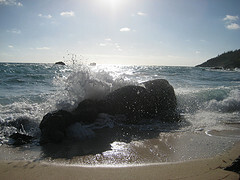 I held my daughter still and watched others fidget. She then shook some hands and swapped pleasantries with the guard of honour and made her way towards Ordnance Island. 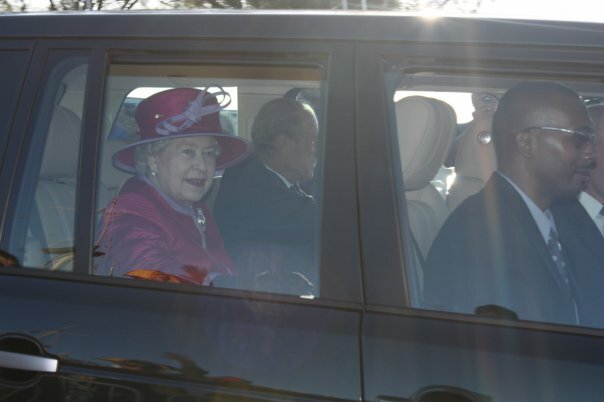 Philip disappeared to one of the two Range Rovers (shipped in for the occasion) but Governor Sir Richard Gozney and it appeared the newly smitten Premier Ewart Brown accompanied The Queen towards us where we had taken up our places on the bridge. The crowd was at it's thinnest here and after some rubber-necking suddenly there she was looking slightly distant but very elegant in a fuschia suit and hat. Do you think Philip has ever seen her without a hat? Anyway I am sure security were only a sharp move away but we could almost touch he r as she walked by and after catching my eye, she continued a foot or so and stopped to talk to my mate, who will make sure we never hear the end of it! And then a minute or two later she was gone as the two Range Rovers and a fleet of governmental cars sped off. 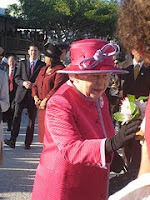 In the end the Bermuda's media finally warmed to the historic and significant occasion and rightly so. During their short stay The Queen and The Duke of Edinburgh attended a Thanksgiving service at the Cathedral on Church St, Hamilton. They took an everyday ferry to Dockyard visiting the Maritime Museum and then by car travelled back to Hamilton passing by schools. The Premier had another chance to mention independence to Bermuda's Monarch at a dinner held at the new Tucker's Point Restaurant on Wednesday night before they were driven past more schools on her way to the airport Thursday morning.